Ana Teresa Fernández, Borrando la Frontera (Erasing the border). Performance at Tijuana / San Diego border, 2011. Photo by Maria Teresa Fernandez.© 2011 by Ana Teresa Fernández. Permission to reprint may be obtained only from the artist. This work appears on the cover of the Spring 2018 issue of Signs, a special issue on Displacement. Ana Teresa Fernández is a visual artist who uses performance as a primary research tool in her multimedia practice. Fernández’s work includes community-based projects, public art, sculpture, performance, video, and larger-than-life oil paintings that critique cultural assumptions and stereotypes about Latina women. Fernandez uses her own experience of having migrated to the US with her family at eleven years of age from Tampico, Mexico, to explore boundaries, myths, and stereotypes that affect those living on both sides of the US–Mexico border. Fernández has had numerous exhibitions of her oil paintings, including at the Denver Art Museum, at Arizona State University, and at the Nevada Art Museum. The Headlands Center for the Arts granted Fernández the Tournesol Award, and her films have been screened and won awards at festivals internationally. Fernández also has done residencies and created work in Brazil, South Africa, Haiti, Mexico, and Spain. She lives and works in San Francisco. Through time-based actions, social gestures using her body, and larger-than-life oil paintings, Ana Teresa Fernández creates artwork that explores the politics of intersectionality, subverts expectations, and illuminates the psychological and physical barriers that define gender, race, and class in Western society and the global South. Fernández’s artistic process begins with site-specific performances that range from public art, to guerilla actions, to community building, and that are documented with video and painting. These performances and events shine light onto untold stories, bringing awareness to socially charged spaces, creating alternate truths, and retelling myths and folklore. 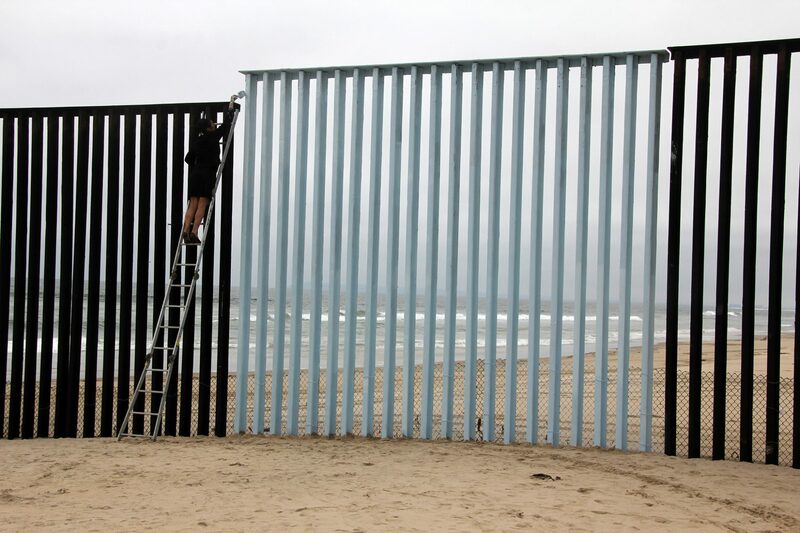 For Borrando la Frontera, the artist painted a portion of the wall at the Tijuana / San Diego border sky blue to create the illusion that part of the wall was erased. The six-hour-long solo performance, during which Fernández was almost arrested, was an intervention to advocate for the thousands of loved ones and families that had been ripped apart by mass deportation and border politics. The piece has now been recommissioned across various states along the border and recorded for a documentary feature by VICE media in 2017, urging the public to reimagine one of the most heavily militarized borders in the world and insisting that freedom is one of our most valuable currencies.